INTELLIGENT CONTROL SYSTEM : The controlling system having is PLC (ALLEN BRADLEY) Base and PC communication on Ethernet. HEATING SYSTEM : Long lasting stainless steel tubular heaters with S.S Fins. SENESOR : Temperature and Humidity transmitter 4-20mA used for measurement. Temperature in degree Celsius and Humidity in % RH with 0.1 Deg.C and 0.1 % RH resolution. COOLING SYSTEM : CFC free the cooling system consists of hermitically sealed compressor coupled with evaporation provided with stand by compressors, coil and condenser, safe guarded by time delay circuit. Refrigerant 134A. ALARMS : Audio and visual alarms are generated for temperature/Humidity variation, utility failure. 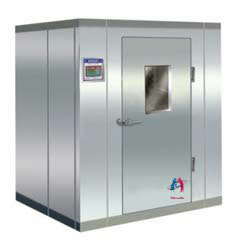 This unit is a double walled chamber, with PUF insulation.Interior is of stainless steel & Exterior is made of stainless steel.The unit has full length inner glass door and outside metal door with magnetic gasket & lock. The unit is provided with perforated Stainless steel trays. 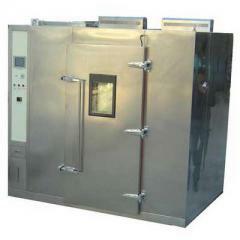 Forced Air circulation for uniform temperature. PU wheels for easy move ability. Common Software : Chambers are connected on TCP/IP (Ethernet) with the centralized work station and transferring data in database. This centralized workstation provides the tool for viewing, trending and alarm management of chambers. Temperature Scanner : 8 point scanner for temperature having 8 temperature probes provided with alarms to monitor various parts of equipment. Stand by Cooling System (Auto Switch Over) : A fully functional cooling system can be provided as standby. It comes in operation automatically when the regular system fails to function. Door Access System with Touch Screen Display : The door access system restricts access to the chamber to authorized persons only. In this system a physical lock is provided additional to this password access control is provided. Maximum six users can access the chamber. Remote Alarm System : Alarm for Temperature & Humidity deviations. Indicator LED to identify equipment deviation. Alarm hooter test push button.